Some of our Luxury Rooms offer a kitchenette ideal for those staying longer. Maximize your stay without maxing out your budget with our affordable weekly, biweekly and monthly rates. Whether you're on an assignment, between homes, relocating or just want to extend your vacation a wee bit more, we understand that night after night in a hotel can add up. That's why we offer our Stay More discount and an attractive alternative to hotel accommodation. 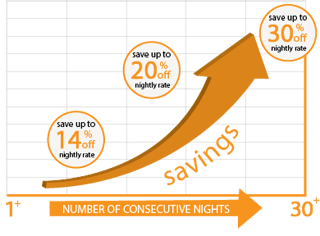 With this discount, the longer you stay, the more you save off of your nightly rate! Long-stay discounts not available during peak season. Maximum percentage discounts equivalent of weekly, biweekly and monthly rates may vary by seasonality. Rates are subject to change or termination at any time. Discounts for stays of up to 29 nights are automatically applied when enquiring online. Please call us for reservations of 30 nights or longer. Stopping in for a week? Staying for two weeks or so? Save up to 20%* off the nightly rate on stays between 15-29 nights. (That's 3 nights free for stays of 15 nights or longer). Settling in for a month or more? Save up to 30%* off the nightly rate on stays of 30+ nights (Please call us for our monthly rates). It's simple: the more you stay, the more you save! Book today!